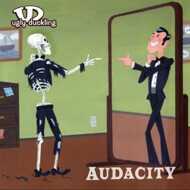 Audacity is hip-hop group Ugly Duckling’s fourth LP and arguably the most ambitious album of their respected recording career. Up to that point in Ugly Duckling’s run, the band was mostly known for their humorous brand of classic rap but on Audacity, Ugly Duckling offered a more musically and emotionally challenging collection of tracks. Songs like ‘I Won’t Let It Die’, ‘I Want To Believe’ and ‘Falling Again’ pushed the limits of sample-oriented, Golden Age hip-hop production and introduced melody and composition in a manner rarely heard in the genre. Because of this, ‘Audacity’ was met with some confusion from the group’s audience but over time, fans have grown to truly value this somewhat melancholy and introspective (but still funky) chapter in Ugly Duckling history. To celebrate the 10th anniversary of Audacity, Fat Beats has decided to re-release the album on vinyl (with an iconic, illustrated cover by accomplished artist Israel Sanchez) for those who didn’t get their hands on the wax the first time around. Also included in the package is an exclusive 7” single with the officially unreleased track ‘Audacity-Part Three’ (Featuring Pigeon John) and, for the first time on 45, ‘I Want To Believe’. Great records tend to reveal their quality over the passing of time and Audacity is, ultimately, a piece of music that deserves to be heard and appreciated.